Chris Cornell performed his new single, “The Promise”, on The Tonight Show Starring Jimmy Fallon on Wednesday and official video from the program is available. 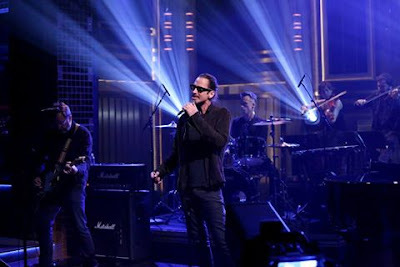 The singer was joined by a group of backing musicians that included bandmate and Soundgarden drummer Matt Cameron, who was recently inducted into the 2017 Rock And Roll Hall Of Fame as a member of Pearl Jam. "The Promise" premiered last fall at the Toronto International Film Festival and opens in theaters April 21. Soundgarden will launch a spring tour of North America with a series of three festival appearances in Florida next week before beginning their headlining run with The Pretty Reckless and The Dillinger Escape Plan at the Fox Theatre in Atlanta, GA on May 3.